Jackee In memory of our Wee Angel, Jackee. John and Mary Magirl and sister Annie. 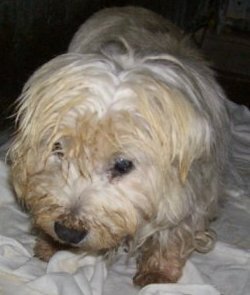 This little girl came into Westie Rescue on March 22nd. She was found in a ditch on the side of a road. She was in very bad shape. She had medical issues too numerous to list along with fleas, parasites and very bad skin issues. Needless to say she did not make it. We just can’t save them all. How did she get in to this point in her life? We will never know. We can only hope that she was loved and cared for at one time. They give us so much and ask so little. We wanted to give her something back. Emily Elizabeth was her name when she was put to sleep. I think we gave her a beautiful name. She left this world to go to the bridge, to be healthy and free of filth and pain once again. Now she is free to run and play with the others who left before her. This is our way of honoring her…..
She will have a place in our hearts forever. 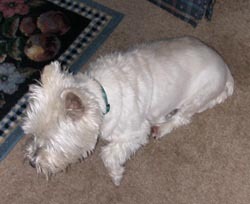 Bonnie was a member of our family for many years. She was very loyal and protective of us, but she had one fear – cameras! The few pictures we have of her show her running away or sleeping. We don’t need pictures to remember her though. She will be remembered in our hearts forever for all the joy, laughter, and love she brought us. 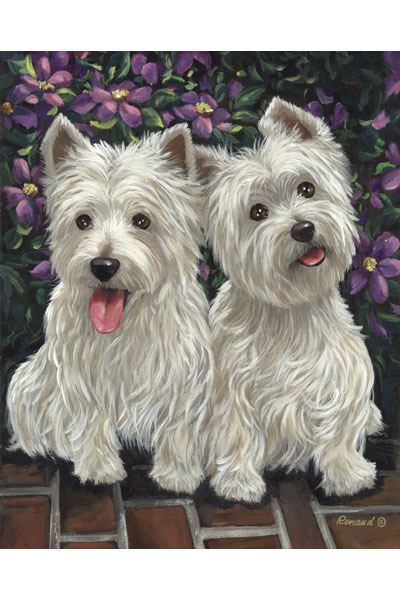 In memory of Bonnie, loved Westie of Gary and Kathy Smith. Donation in her memory: Gary and Beth.